I absolutely love the Death Note anime series and everything about it especially the characters so it was only a matter of time before I created this post on Ryuk’s cosplay. We’ll be showing you everything from his outfit, wig and makeup to pull off a perfect cosplay. Ryuk is the main shinigami featured in the show, shinigami meaning ‘death god’ and the owner of the Death Note although the one he dropped for Light Yagami to find was not his (it was Sidoh’s) but he wrote the rules for it. This is a popular cosplay choice because of the success of the show aswell as the detail that has gone into each character’s outfit and personality. Most anime’s characters are two dimensional and the plot is predictable but Death Note is the complete opposite there are very few characters and therefore more time to devote to each one with a plot that is always surprising you. As a god of death you will be dressing in all black. 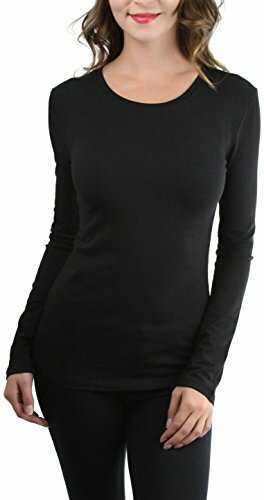 Wear a long sleeved black shirt and black shiny pants. 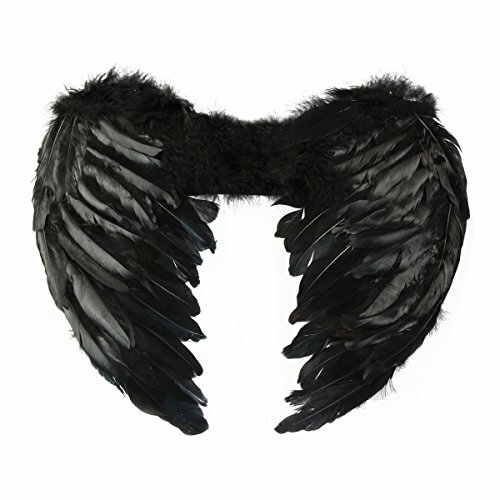 Glue feathers onto the shoulder of the turtle-neck individually using a hot glue gun or attach a black feather boa such as the one pictured instead which will save tons of time. Then wear a black leather belt with a toy skull attached around your waist. Or go your own direction and mix and match different items these can be Gothic style so they look the part and come from thrift stores, online and existing or old cosplays from your closet just make sure everything looks cohesive at the end. Once the clothing is done you’ll need to do the hair, this can be a wig or your own hair styled. 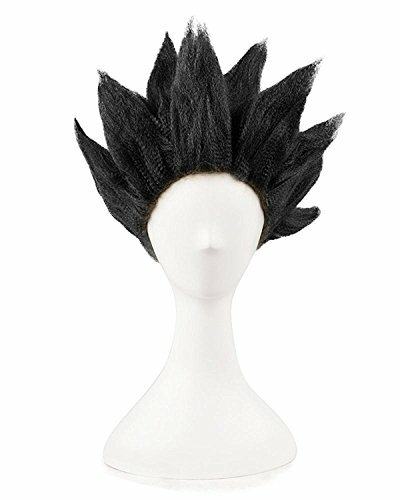 Here is a wig (pictured) that you can use which is fairly short, with the rugged not been washed look you’re going for. I love how atmospheric it is and she does a great job with the voice-over too! The artist uses grease paint not typical crème paint because she says it is easier to blend and easier to take off although it does require setting with powder if it’s worn for a long period of time. Firstly apply white grease paint using a large brush all over your face and neck to form the base. Next using a light grey paint shade the centre of your forehead, nose (except the tip) and your cheek bones. Then draw on the lips with purple using an image for reference and using a thin brush to fill them in. Use black grease paint for shadowing around the inside of the lips. Then draw on the eyes with a darker shade of purple which are round but with ends that taper up using black grease paint again to roughen the edges. Create Ryuk’s unique shaped nostrils by extending your natural nostrils up and down curving slightly into each other. Then draw in the wrinkles on the nose. Create the widows peak with the black paint. Then paint over your eyebrows with white crème make-up. Using liquid latex create the creases in Ryuk’s skin around the nostril and cheek areas. Finish off any highlighting with the white crème and set everything with powder. You may be wondering how you can create the eyes, well there are many different ways to go about it. 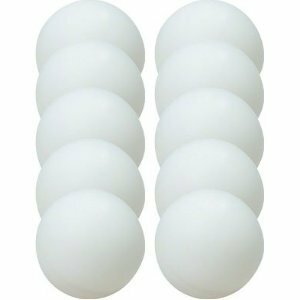 One way is to use ping pong balls painted yellow with a red dot in the middle, the downside to this is you’re vision will be impaired but it will look more effective overall. For a simpler way paint your eyelids like the eyes however you’ll need to keep your eyes closed which isn’t practical but will work well for photos however your vision will not be impaired like the ping pong method as long as you keep your eyes open. Top everything off by keeping a Death Note on hand to drop into an unsuspecting human’s hands and be eating an apple (shinigami love apples). This is a great choice for couples with Sidoh and friends or even group as Light, L and Ryuk.